It is very rare that i can find white asparagus in the markets around here. Not only are green asparagus the norm here, but they can be purchased just about all year-long. 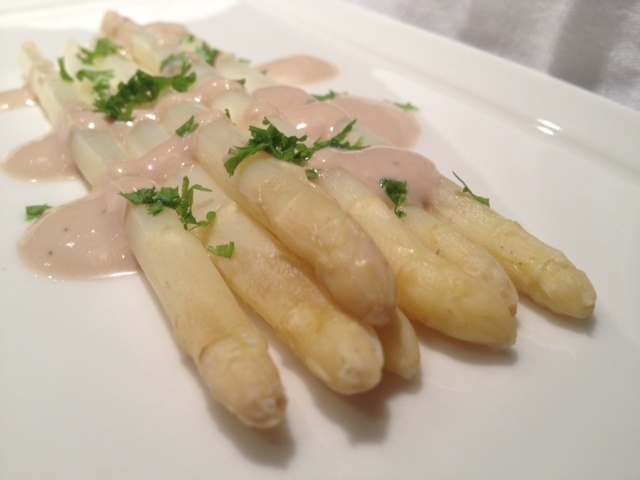 Normally white asparagus can only be found in the late spring, or early summer. At least that’s how it was when I was living in France. When it was white asparagus season, my mom would buy them at every occasion, and so we would be eating asparagus for 3-4 weeks or until they were no longer in season. Mom would also buy several “bottes” or “bundles” that she would clean up, and can for the rest of the year… Such good memories. Yum!!! Today, I was lucky to find some at the fresh market. I do not know where they came from, but they are such a rarity here that i bought two bundles for dinner. The asparagus were very very narrow though. A good size asparagus should be the size of your middle finger in width. The one I bought were smaller than my pinkie so it was not easy cleaning them. Yes, unlike green asparagus, white asparagus need to be peeled. So you want to use a potato peeler, place the asparagus on a flat surface and peel the skin off the asparagus all around. You do so, by turning the asparagus a small angle at a time, then you peel it, then you turn it, then you peel it. You always want to start from the head of the asparagus and peel down towards the end. For 4-6 people, you will need 2 bundles. Once they are peeled, the cooking and the preparation are very quick and easy. You will want to trim with a knife the end of the asparagus by cutting at least 1 inch off the end. Then place all the asparagus in the large round mold. Sprinkle a bit of salt ( a dash is enough). Cover the round mold with the octogonal silpat and cook in the microwave for 5 minutes. You want the asparagus to be a bit firm still soft, not soggy. I cooked both bundles for 5 minutes, and they were perfect! Once they were cooked, I let them cool off because I wanted to eat them as an appetizer with a vinaigrette, but you can eat them warm with a hollandaise sauce. They would be awesome. Check my recipe for the hollandaise. For the vinaigrette you will need: 4 tbsp of heavy cream, 4 tbsp of sour cream ( regular, or fat-free), 4 tbsp of balsamic vinegar, 1/8 tsp of salt 1/16 of pepper, 1 tbsp of fresh parsley chopped for decoration. In a small bowl, mix all the ingredients from above except the parsley and serve with the asparagus. 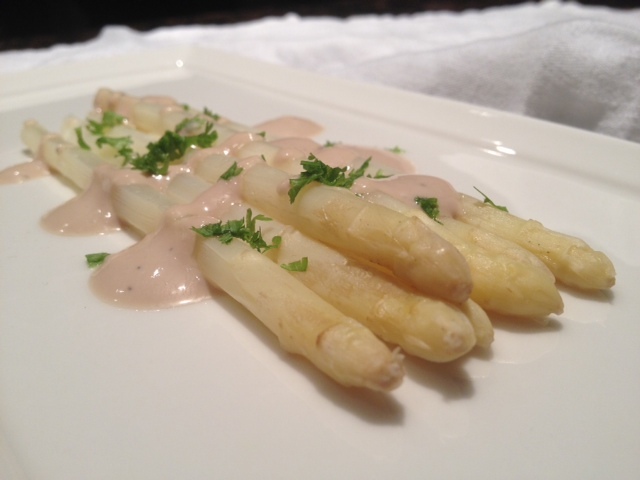 To serve, place the asparagus flat on a large plate and drizzle the vinaigrette over the asparagus. Sprinkle the chopped parsley over the asparagus. Et voila!! !